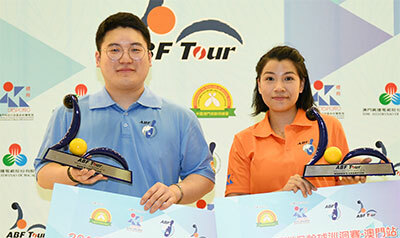 24th June, Macau: Tour debutant, Lee Jung Soo of Korea averaged 256 and Nora Lyana Natasia of Malaysia averaged 239 to capture the Men's and Women's titles of the ABF Tour Macau 2018 at COTAI Bowling Centre on Sunday. In the title match between 2018 Macao-China International Open fourth runner-up, Lee and Ryan Lalisang of Indonesia, both could not string together strikes and were level up to the fourth frame. The Korea opened up a slender lead after the fifth frame as Lalisang rolled good shot but just could not strike. Lee extended his lead with another strike in the seventh frame while the Indonesian just could not get the carry he wanted and just converted his single pin spares up to the eight frame. Whilst the left-handed Korean encountered the same problem, Lalisang just did not strike, allowing Lee to win the match and take the title, 219-195. The champion dispatched Yuhi Shinbata of Japan, 276-256 in the first semi-final match to advance to the final. He narrowly defeated Tony Wong of Hong Kong in a high-scoring 275-267 in the opening round before beating Shoumick Datta of India, 256-224 in the second round. Lalisang ousted left-hander, Jimmy Chueng of Hong Kong, 255-217 in the first semi-final match to face the Korean in the final. The first runner-up defeated another Hong Kong national, James Lui 277-266 in Round 1 and then a second lefty, Kim Bolleby of Thailand, 235-226 in Round 2. 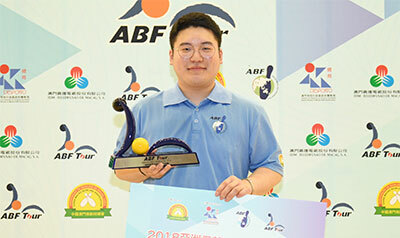 Newly-crowned 2018 Macao-China Open champion, Pak Kyung Rok of Korea was elimnated in the opening round when he lost to 2015 ABF Tour Thailand leg champion, Lee Tak Man of Macau, 245-278. 2018 Macao-China Open first runner-up and 2017 World Championships Trios gold medallist, Wu Siu Hong of Hong Kong also crashed out in the first round to Yuhi Shinbata, 225-265. Lee was awarded a trophy and a prize of US$500 for the victory while Lalisang took home US$300. Shinbata and Cheung earned US$150 each. Ms Fang Fei, Jess, Head of Sports Support Division, Sports Bureau of Macao SAR Government. Meanhile Malaysia's Nora Lyana Natasia took her maiden tour victory after she breezed past debutant, Futaba Imai of Japan, 267-209 in the women's final. Natasia got off brilliantly with four strikes-in-a-row to open up a a comfortable gap of 45 pins when Imai failed to knock down any. With another open frame in the fifth from the Japanese, the match had looked beyond the challenger. But Imai did strike twice but had to concede defeat, 209-267. Natasia edged 2018 Macao-China Open first runner-up, Kim Hyun A of Korea by one-pin, 235-234 to make the finals. The champion also edged compatriot and 2018 Macao-China Open second runner-up, Nerosha Keligit, 199-167 in the second round. The Malaysian sailed past Thailand's Kantaporn Singhabuboha, 255-200 in her opening round. Natasia also pocketed US$500 and was awarded a trophy by Ms Vivien Lau, ABF Tour Committee Chairman and World Bowling Secretary General. The first runner-up took home US$300 while the second and third runners-up earned US$150 each. 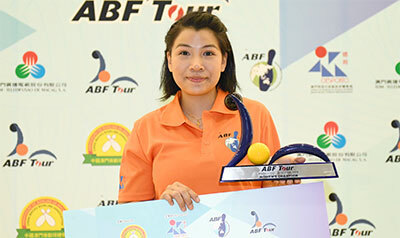 The ABF Tour Macau 2018 leg is the second of four legs to be staged in East Asia. The next stop will be in Hong Kong, China on July 1. For further information and details, please contact ABF Tour Committee at Tel: +852 2893 6039, Fax: +852 2893 6290; Email: hktbc@netvigator.com.